When I heard the theme for the Papertrey Ink February blog hop, I didn't want to do a kid's card like I did earlier this month for a Papertrey Ink Anniversary challenge. I took out my zipper and slider dies that came this week with every intention of making a "grown up" card. But no dice! Every idea lead me down the same path. So I scrapped the whole zipper and slider thing and tried my first pop up card! When I first saw the Front & Center 2 die, I hesitated getting it at all even though I loved the shape. How many gift bags would I make after all? My heart won out and I've been using it to do cards since I got it. Inside the frame I used my new Beautiful Butterflies stamps in a variety of colors. The stamp has a mix of small, medium, and large images, so it really lends itself to this kind of stamping. I used my Mat Stack 1 and Mat Stack 1 Layerz to create the frame within a frame. The sentiment is stamped on vellum and stretched over the aperture. Just a tip: If you want the background to be more obscured, pop the vellum up. If you want the background more vibrant, adhere your vellum strip directly over the background. Inside is where the movement starts! I couldn't decide which butterfly was best, so I cut out each of them in different colors. I'm not a butterfly person, but I have to say I'm in love with the Beautiful Butterflies stamps and dies! So many possibilities! I'm off to visit the other blog hoppers! I know I'll see some amazing stuff! As always, thanks so much for visiting! Ooh, so pretty! I love how you used the butterfly stamp set and dies! Such a fabulous card, I love your vibrant colours. Great colors and such a happy card! Aloha! Oh my goodness, what a stunning creation! I LOVE what you have done with the butterflies! Love your aperture and the pop up butterflies! Great card. Love your use of the front and center die. Oh the COLORS, this is so awesome, JJ!!! I just love your pop up butterflies and the beautiful stamping in the window on the front. Great use of the Front and Center die! Forgot to tell you I love the stamping you did inside the window too! So pretty! Love all the butterflies too, your card is wonderful! This is just so bright and fun and perfect for that special someone of any age. I love how you've got two areas of butterflies going on. The front is so pretty and special, that who would ever expect there to be such a colorful surprise inside. I'm so glad I got this set--I'm pinning this one for a future case. I love the vellum sentiment in front of the colorful butterflies!! That looks really stunning :) Then to open up and see the butterflies pop out at you? Great idea!! Awesome job with the pops of color! JJ - The butterflies are so pretty - at first glance I was in love with that scallopped die cut front butterflies really stole the show. I love how you kept the theme throughout and all the different colors. Really pretty! Awesome. And I love how colorful those butterflies are! So pretty and colourful! Love it. Gorgeous card.LOve all the colorful butterflies! Gorgeous. Love what you did on the inside and outside of the card. I like all of the colors of butterflies, very nice. Love this! I adore that butterfly set, though it didn't make the cut this time on my shopping list. What a cheery wonderful fun card. The recipient will love the butterflies, no doubt!! Love this pop up....so bright and cheerful! lovely bright card! congrats on your first pop-up card :) they sure are addictive! 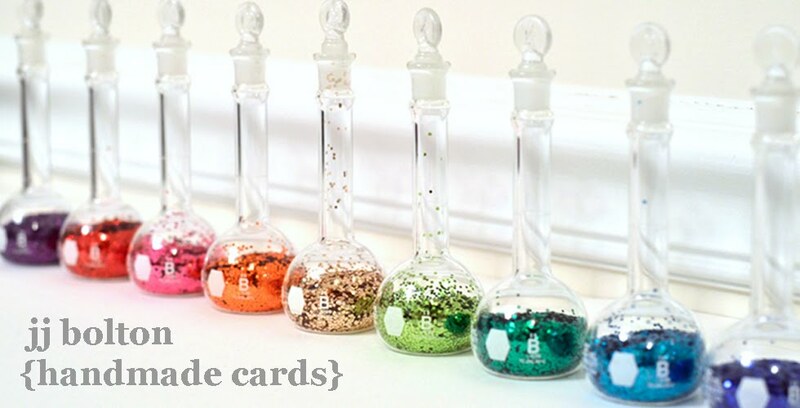 Trying to decide what part of your card I like best... Awesome use of front and centre, love the matted window and your pop-up butterflies are perfect rainbow yumminess! 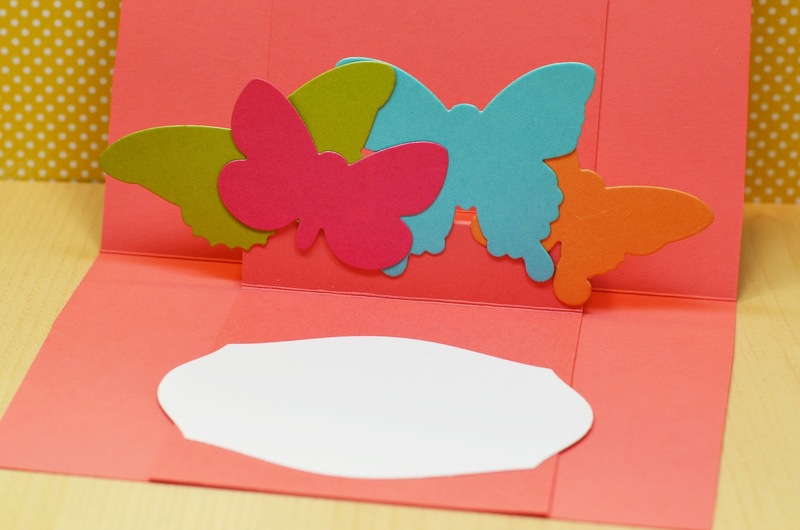 Fun to use the butterflies inside the card, great job. These exploding butterflies are wonderful! Way to rock out the PTI blog challenge. 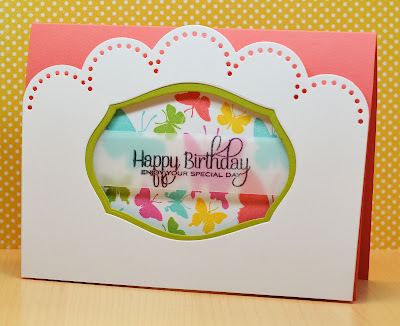 Oh, I love all the bright colours you've used, and what a terrific way to showcase the Front & Center die! Totally not just for gift bags. Wow!!! What a beautiful card!! So fun and colorful!!! This is delightful! Interactive cards are so much fun, and this creation is so full of wonderful colors and springtime goodness. Tremendous job!